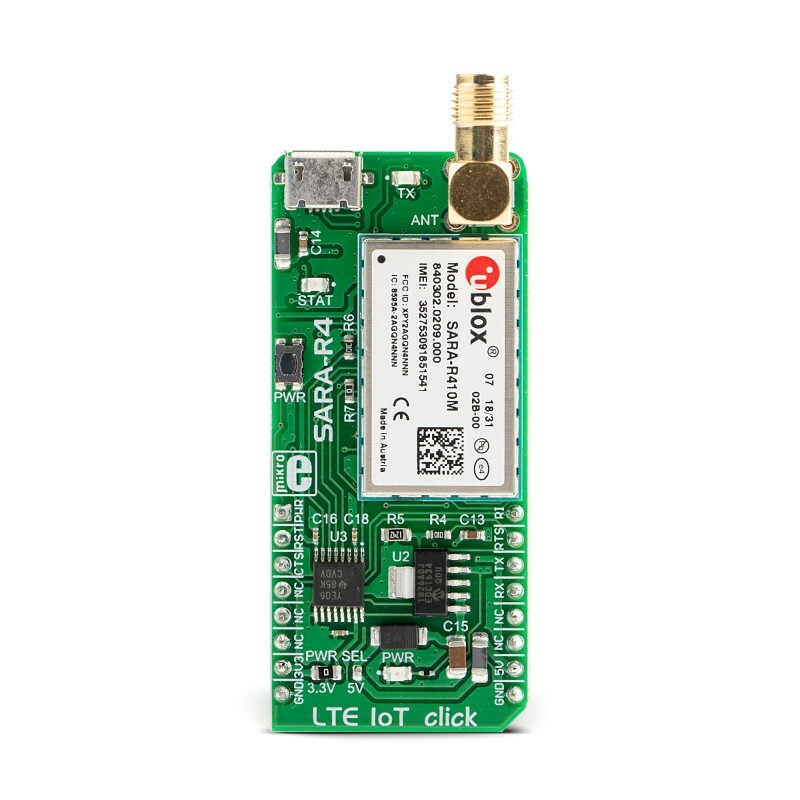 LTE IoT click is a Click board™ that allows connection to the LTE and 2G networks, featuring the compact form-factor SARA-R410M-02B LTE/2G module, which offers two LTE technologies aimed at Machine to Machine communication (M2M) and the Internet of Things (IoT). 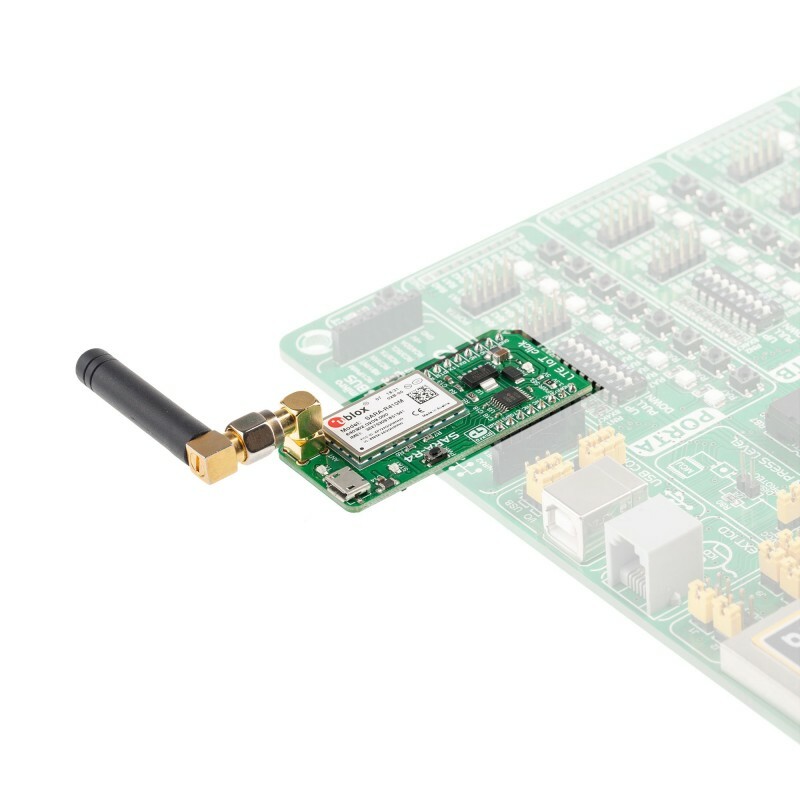 This module is an embedded IoT communication solution which supports the LTE Cat M1 and Narrowband 1 (NB1) technologies, offering an alternative to similar Low Power Wide Area Network (LPWAN) solutions, such as the ones provided by Sigfox and LoRa. The LTE CAT1 and Narrowband 1 technologies are designed with specific requirements of the IoT network in mind. LTE IoT click also offers various other features, allowing a simple and reliable connection to these new 3GPP IoT technologies. SMA connector on board for the RF antenna, network and status indicators, familiar u-Blox AT commands set over the UART interface, USB connector for interfacing it with m-center software application from u-Blox, are just some of the features available on the LTE IoT click. 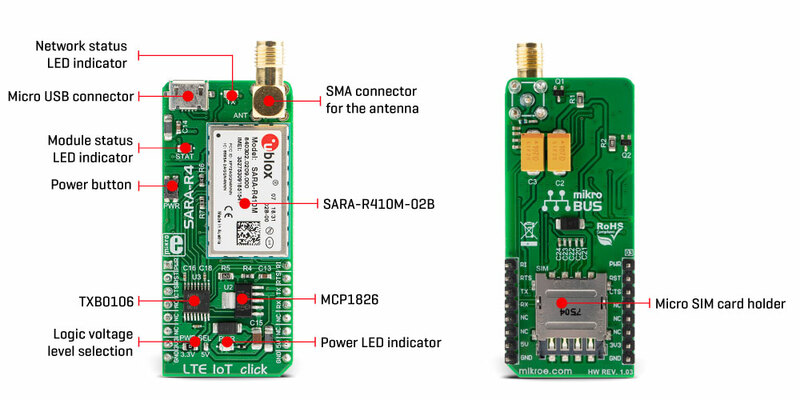 A rich set of Internet protocols, industry-standard interfaces (UART, USB…) and driver support for all the major operating systems allow the Click board™ to be used in a wide range of M2M applications, such as smart metering in various industries (agriculture, gas distribution, water distribution), product tracking, and more. LTE IoT click is equipped with the SARA-R410M-02B LTE/2G module from uBlox, which supports LTE CAT M1 and Narrowband 1 (NB1) technologies, developed with IoT applications in mind. In addition to these technologies, there is also support for the multi-mode EGPRS. The specific module revision (SARA R410M-02B) used on this Click board™, allows multi-regional coverage, supporting CAT M1 / NB1 bands: 2, 3, 4, 5, 8, 12, 13, 20, 28. Operator profiles and LTE bands can be configured by the software, thus enabling coverage for a wide range of different regions. Very compact form-factor of the module, a low number of external components required, and the ultra-low power consumption, makes this module a perfect choice for the forthcoming 3GPP IoT technology. SARA R410M-02B module is the main component of the click board and it consists of a number of internal blocks or sections, such as the RF section, memory section, power management section, and the cellular baseband processor with the peripheral interfaces. BG96 module supports several peripheral interfaces, including USB, UART, SIM card, I2C, and GPIO interfaces. The UART interface operates at 115200 bps by default and it is used for exchanging AT commands with the host, data transfer, and the firmware update. The UART supports baud rates of 9600, 19200, 38400, 57600, and 115200. In addition, the module supports automatic baud rate detection. This interface is used for data transmission and exchanging AT communication commands with the host MCU. The USB interface acts as a device and can be connected to a USB host, such as the personal computer (PC). The USB interface requires software drivers for the particular OS, allowing the proprietary application from u-blox called m-center to be used, offering a clean and comprehensive interface for accessing the main functionality of the module, setting up the configuration parameters, managing SMS messages, tracing the module activity, and more. For a complete list of features and m-center software support, please visit the official u-blox web page. The SARA R410M-02B module has to be powered by a clean and stable power supply. The voltage needed for the module to work properly is about 4V and it is derived from the 5V mikroBUS™ rail or the USB connector. It is regulated to 3.8V by the MCP1826, a 1A low drop output (LDO) regulator from Microchip. Although the SARA R410M module is an ultra-low power device, the cellular network modules, in general, are notorious for their high-power consumption while actively exchange data, so 1A LDO had to be used. Digital sections of the SARA-R410M-02B are supplied by 1.8V, so it is necessary to condition the incoming communication bus lines which connect the host MCU with the module. By utilizing its internal LDO regulator, the SARA R410M module provides the needed reference voltage for one side of the TXB0106, a 6bit bidirectional level shifter and voltage translator. The reference voltage for the other side of the TXB0106 level shifter is taken from the onboard SMD jumper, labeled as PWR SEL. 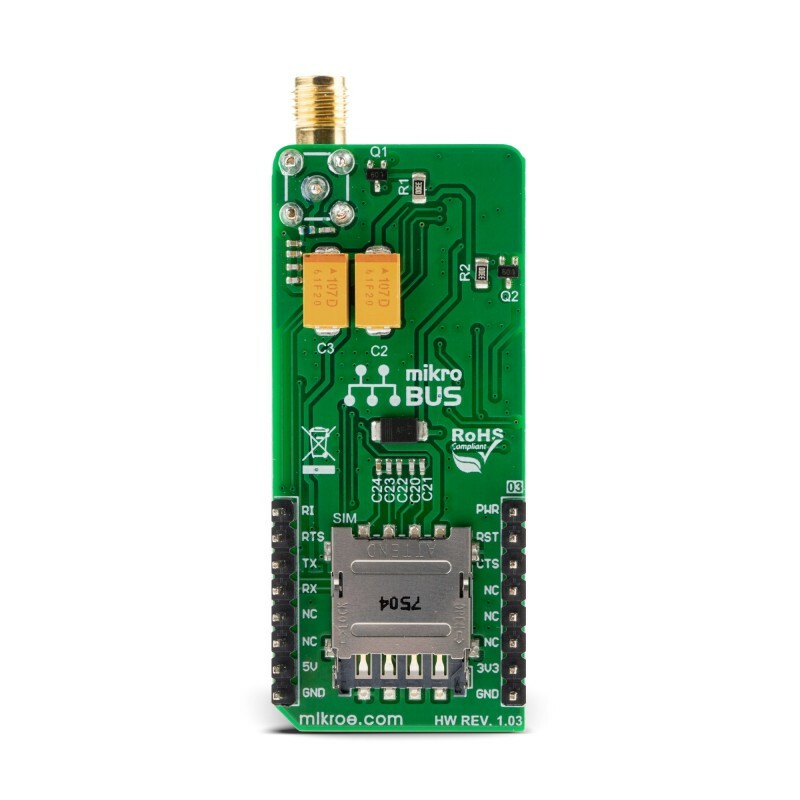 This jumper is used to select between 3.3V and 5V from the mikroBUS™, depending on the used MCU type and its logic voltage level requirements. The main UART bus of the module is connected to one side of the TXB0106 level shifter, while the other side is connected to the respective mikroBUS™ UART pins. However, the SARA-R410M-02B module is designed like the traditional DCE device (Data Communication Equipment) offering the full serial interface pin count, including the hardware flow control pins (CTS, RTS, RI). These pins are routed to the mikroBUS™ CS (CTS) and the INT pin (RTS) and can be used in the MCU software if hardware flow control is needed. The RI pin is the ringing indicator, and it is routed to the mikroBUS™ PWM pin. The PWR_ON pin is routed to the mikroBUS™ AN pin, as well as on the onboard pushbutton labeled as PWR. A LOW pulse on this pin (button pressed) will toggle the power status of the device. If powered down, and the valid power supply voltage is present, a LOW pulse with the duration of 150ms on this pin will power up the device. The successful action will be indicated by the STAT LED. If the device is already powered up, a LOW pulse with the duration of 1.5s on this pin will power the module down. It is also possible to power down the module by issuing the AT+CPWROFF command. Both methods are considered safe and will let the module log off from the network and allow the firmware to save important data, before completely disconnecting the power supply. An abrupt loss of power might lead to unwanted consequences. This pin is pulled to a HIGH logic level by an internal resistor. A logic LOW level with the duration of 10s on the RST pin of the mikroBUS™ which is routed to the RESET_N pin of the SARA-R410M-02B module will cause an abrupt power down (forced power down). The RST pin is pulled to a HIGH logic level by an internal resistor. The Micro SIM card holder on the back of the Click board™ is used to install a micro SIM card. This device cannot be used without a valid SIM card, which allows connection to the cellular network. Both 1.8V and 3V SIM card types are supported. This table shows how the pinout on LTE IoT click corresponds to the pinout on the mikroBUS™ socket (the latter shown in the two middle columns). 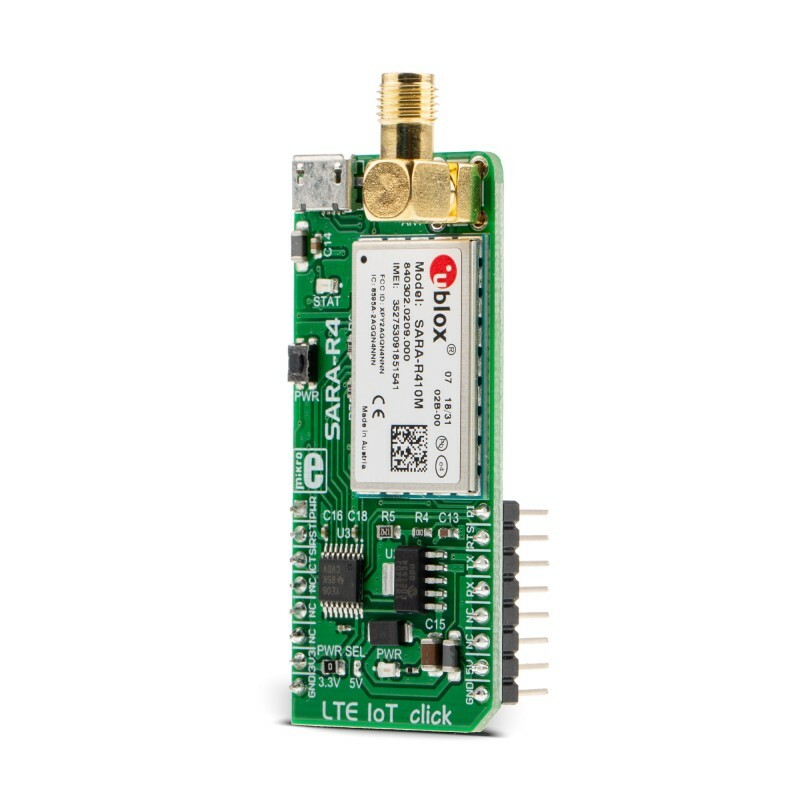 We provide a demo application for LTE IoT Click on our Libstock page, as well as a demo application (example), developed using MikroElektronika compilers. The demo can run on all the main MikroElektronika development boards. Application Initialization - Initializes driver, power-on module and sends a few commands for the default module configuration Create UDP socket and sending the message to UDP socket. Command : AT+CGATT? - Verifies the SARA-R4 module is attached to the network. Command : AT+CEREG? - Verify the network registration status. Command : AT+USOCR=17 - Create a UDP socket. Command : AT+USOST=0,"IP address",port,number character,"message" - Connecting and storing text on the server. Command : AT+USOCL=0 - Closing the socket. Alongside with the demo application timer initialization functions are provided. Note that timer is configured acording to default develoment system and MCUs, changing the system or MCU may require an update of timer init and timer ISR functions. The full application code, and ready to use projects can be found on our Libstock page.